Want to join by Snail-Mail? 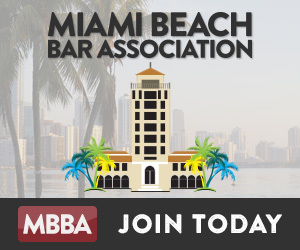 Download the MBBA Membership Application in Word Document format, and make check payable to “Miami Beach Bar Association” and mail it with your completed application to the address on the form. Please know that you will still need to create your account on our website in order to gain access to important information only available to our members. REGISTER ONLINE AND CHECKOUT WITH CHECK!